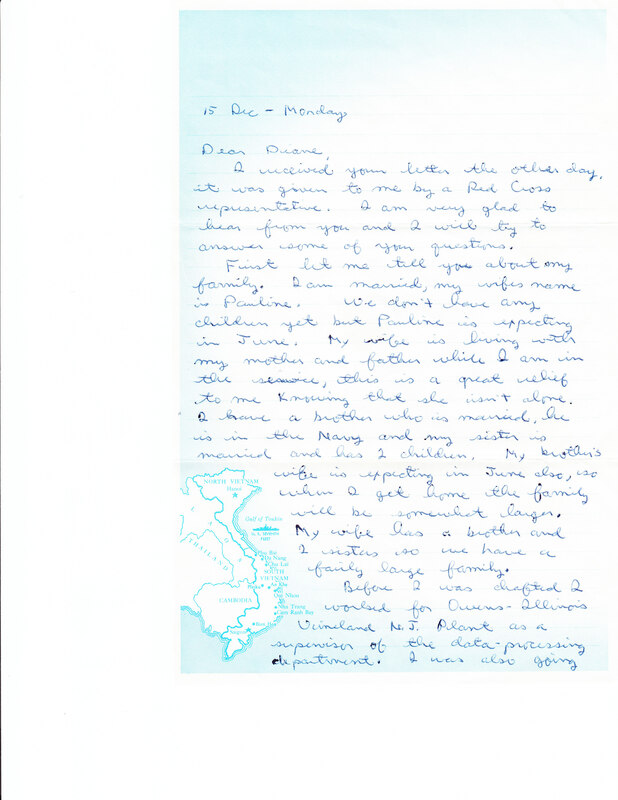 The soldier’s letter is from Vietnam and is dated Dec. 15, 1969. It looks surprisingly new, considering it now reflects decades-old history. Staff Sgt. Fred Laning had written to me in 1969, in response to a letter that I had sent to “any Vietnam soldier” as part of an elementary school project. His reply had said he was in a Vietnam hospital in Cam Ranh Bay, recovering from malaria, and that he would soon be going back to the field. At that time, he had another 10 months left prior to his scheduled discharge from the Army. I never knew if Fred Laning had made it through those 10 months safely, and whether he had made it home to his wife, Pauline, and their first child, who was to have been born while Laning was still on duty in Vietnam. I hoped he had made it back alive, but of course wasn’t sure. But recent news coverage of the Iraq War’s “10-year Anniversary” made me think again about the homesick soldier who had long ago answered a young student’s questions about war. Vietnam and Iraq. Both wars involved an America divided and contradictory political arguments as to why we engaged in the war. Both wars involved gruesome civilian casualties and terrible life-changing injuries to soldiers. In each, anti-war protests raged on back home, even as soldiers’ comrades died in horrible ways far from home and loved ones. Vietnam is now a shadowy historical footnote for those in my generation. We may have forgotten that many Vietnam vets were not able to leave that war behind them and many communities did not embrace them. Some Vietnam vets came back to lost marriages, drug and alcohol addictions. Many could not deal with their personal ghosts–not physically damaged, perhaps, but mentally never the same. Staff Sgt. Laning wrote of his Vietnam experience at that point, “Most of the people over here don’t really know what they are fighting for, that goes for both sides.” He also wrote that he didn’t personally believe in war. He had been drafted, so he hadn’t “signed up” for the duty. He had to leave a job, his educational goals, his expectant wife and unborn child. But he did go, and he did do his duty. Soldiers await the news that they can go home. Parents back home wonder if their child will be a headline that day. Many of us, in the meantime, continue to protest and probe our leadership’s decisions about international policy, focusing our energies and messages on our political leadership versus ever reflecting on our military. And so, my message for this Veterans Day is about the need for us to continue supporting our troops, no matter what side of the political spectrum we support. Our troops are still out risking their lives–and putting their families on hold–on our behalf. And those who have returned still need our support and care. So this Veterans Day, or any day, send a letter of support to a soldier or a soldier’s family. Hire a veteran. Hang the U.S. flag or visit a cemetery and place a flag or flower at a soldier’s grave. Reflect. Give blood. Pray. Check out a site like our ourmilitary.mil for additional ways to support both active military personnel as well as veterans. I hope that Fred Laning reads this, because that will mean he made it back alive. And more importantly, I hope he was able to leave the horrors of Vietnam behind him and return to his family without any ghosts. I’ve kept his letter all of these years, preserved in a scrapbook, probably placed there so many years ago because it had been cool to get a response back from a real soldier. Now, as I look at it and read it more carefully, I’ve learned much more about how a young man felt so many miles away from the family he loved. And I can see so much more clearly how it must have felt to be in such a terrible place, doing such terrible things, but still doing them out of a sense of duty. We should have thanked them all back then. I’m thanking them now. Author’s note: Just recently I was able to locate Fred Laning, who did indeed survive his deployment in Vietnam, return to his family and move on with his life. I had the opportunity to talk with him by phone. He was amazed that his letter from over 40 years ago was still in existence. It has now been sent back to its kind author, as a piece of both his own family and U.S. history. This entry was posted in Veterans Day and tagged memories, PTSD, Vietnam by dblum4blog. Bookmark the permalink.